Happy Halloween weekend! We celebrated Halloween with a WICKED dinner party for twelve. Cooking for twelve can be daunting – so we hosted a potluck party with a FRIGHTENING menu. Our guests were just as excited as us to create a SPOOKY dish, fit for ghosts, goblins and witches. We are very excited to share our Appalling Apps, Menacing Mains, Sinister Sweets and Creepy Cocktail with you. Bone Appetit! We created an elegant table scape featuring Williams Sonoma’s Macbeth inspired dinnerware. We love the HAUNTING images of Hemlock Root, Toe of Frog, Witch’s Brew and Wool of Bat on the plates, platters and napkins. Bed Bath and Beyond’s bat shaped table mats and Pottery Barn’s bat shaped dipping bowls complemented our dinnerware perfectly. The spiderweb place card holders featured OMINOUS tombstones with guests’ names. We added orange daisies, black calla lilies and candy corn to incorporate the traditional Halloween colors on the dining table. 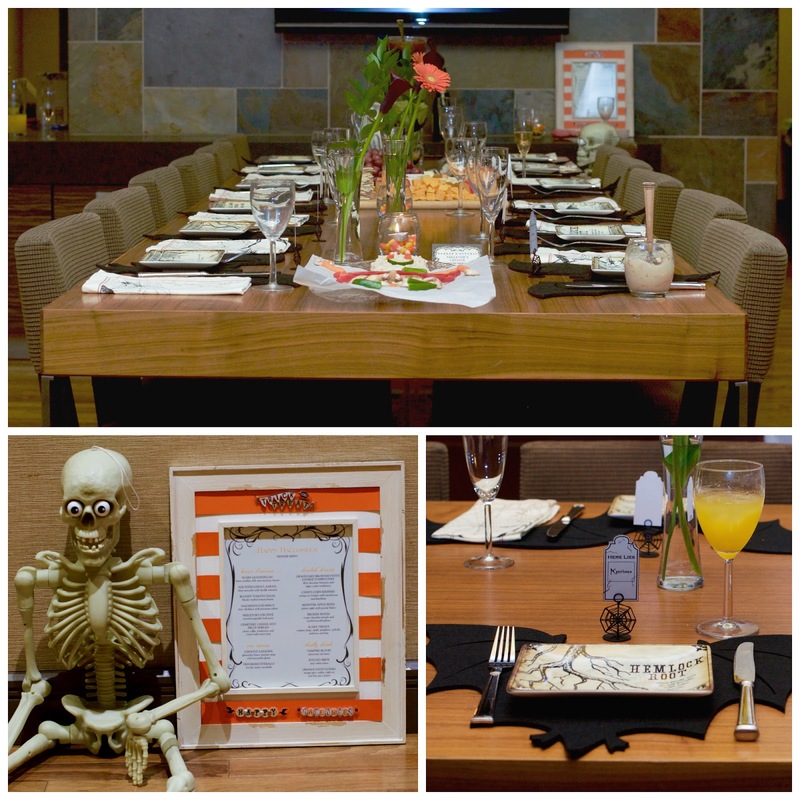 We used Must Have Menus to create our SPOOKTACULAR menu featuring Horror d’oeuvres, Erie Entrees, Devilish Desserts and Deadly Drinks. We served SCARY quesadillas with Bloody Tomato Salsa and Ghoul-a-mole. These are easy to make with Halloween cookie cutters and our guests LOVED them. We also served Hazardous Hummus and a Cemetery Cheese and Fruit Spread. 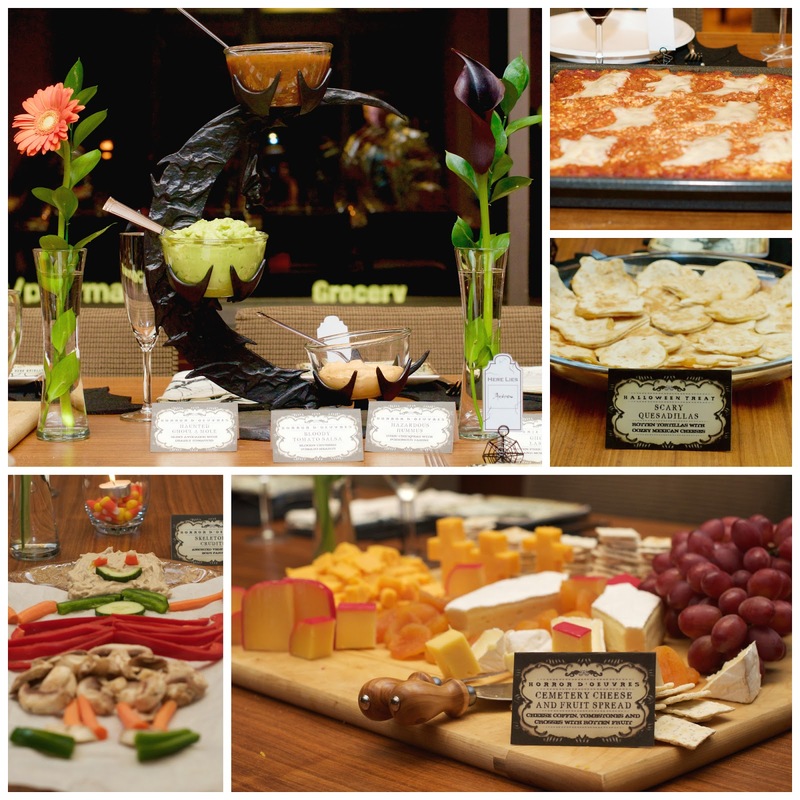 Our guests had a lot of fun molding Brie into coffins, Cheddar into crosses and Fontina into tombstones. Another guest created a skeleton out of vegetable body parts. For the mains we served a Lasagna with Mozzarella Ghosts and Eyeball Turkey Meatballs. 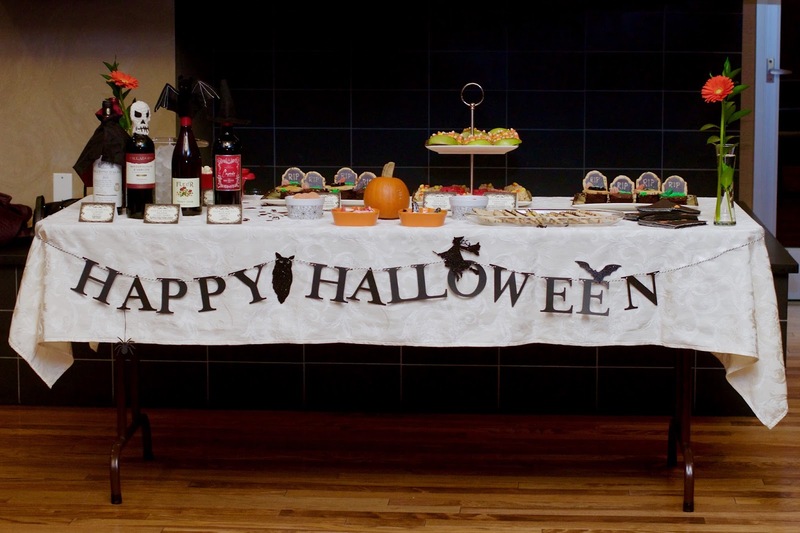 We adorned the dessert table with a CREEPY banner from Williams Sonoma and orange daisies. 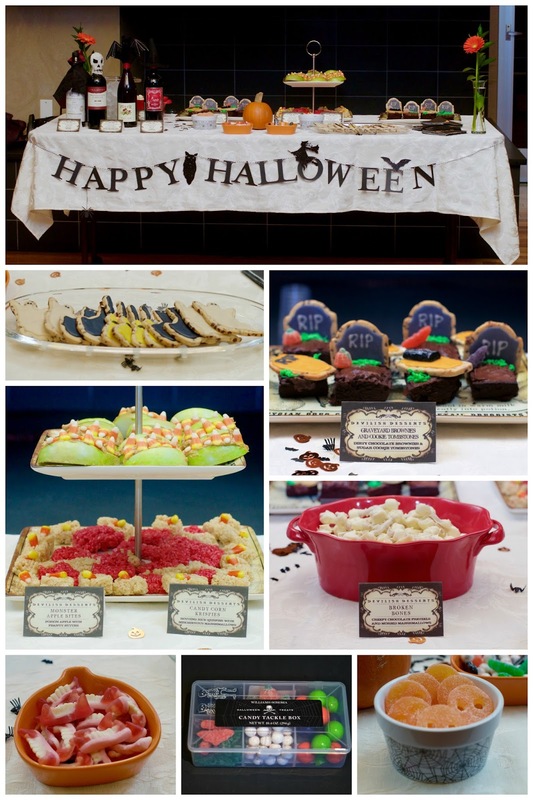 We had a lot of fun composing the dessert menu with Graveyard Brownies with Sugar Cookie Tombstones and Coffins, Monster Apple Bites, Candy Corn Krispies, Broken Bones, Vampire Fangs and Gummy Skulls. 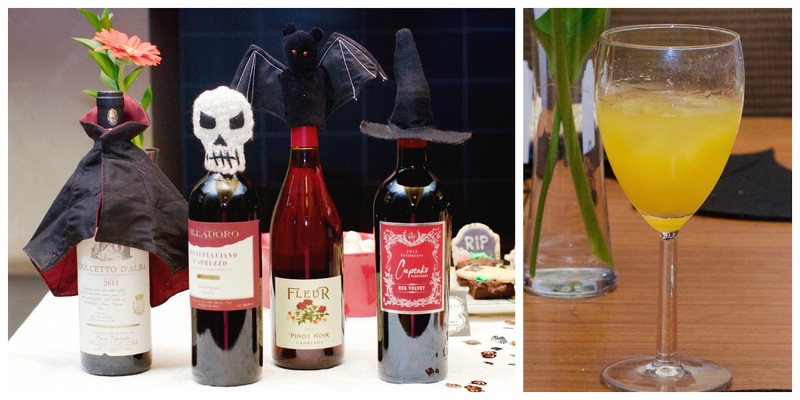 Even our wine arrived in costume with these whimsical bottle toppers from Pottery Barn! We believe every party should have a signature drink. Our creepy cocktail this year was InStyle Parties’ Orange Satin Cosmo. 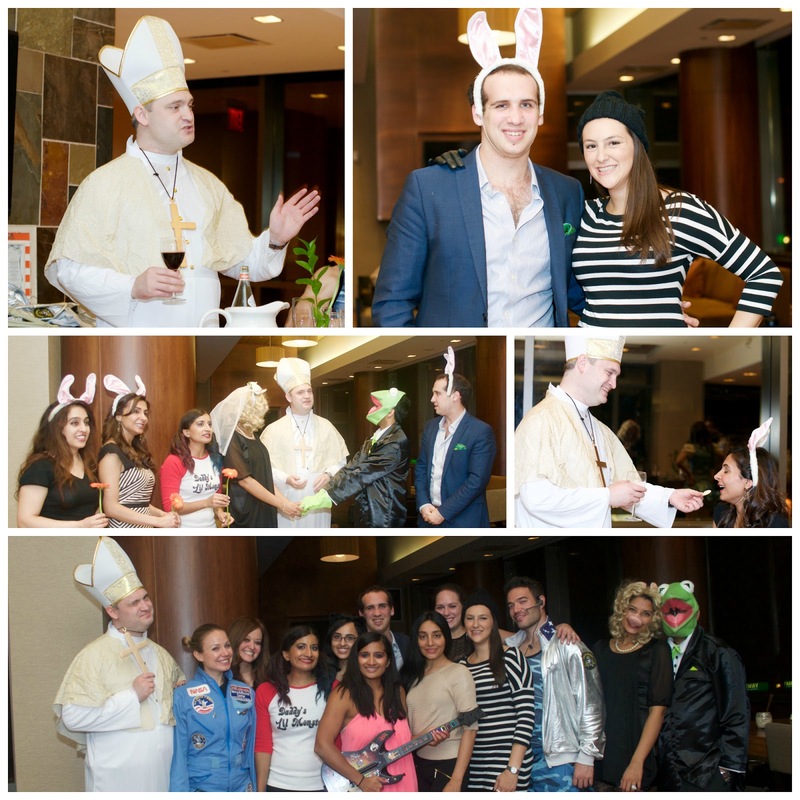 Our special guest was the pope who blessed our meal, gave communion and even officiated Miss Piggy and Kermit’s wedding. We had an AMAZING time at the party! Previous Post Boo-tiful Cookies and Brownies! Your planning details are really helpful dear. This year I had planned my Halloween party at LA venues. I invited few of my close friends and family there. We all had great time there at the party and everybody loved the arrangements. thank you curtis03 Lewis- stay tuned for many more exciting parties in the new year! Your blog is very nice thank you for this wonderful information I like very much for this article Pakistan gift online.